Aquatic plants, turbulence and sediment fluxes interact with each other in a complex, non-linear fashion. 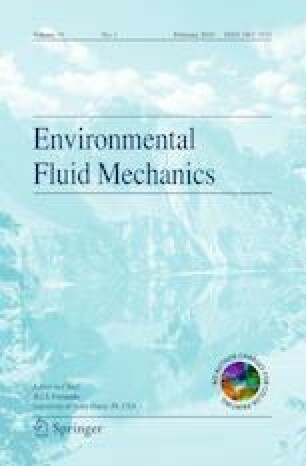 While most studies have considered turbulence as being generated primarily by mean flow, it can, however, also be generated by the action of the wind or by the night cooling convection at the surface of the water column. Here, we study turbulent interaction with vegetation and the effects it has on sediment suspension, in the absence of mean flow. In a water tank containing a base layer of sediment, turbulence was generated by oscillating a grid with the main objective being to determine the differences in sediment resuspension in sediment beds over a wide range of consolidation times (1 h–3 days), for a set of model canopies with different structural characteristics: density and flexibility, and for three types of sediment beds. The greater the consolidation time was, the lower the sediment resuspension. For bed consolidation times below 6 h, the concentration of resuspended sediment was approximately constant and had no dependence on turbulence intensity. However, for higher bed consolidation times, between 6 and 3 days, the resuspension of the sediment beds increased with turbulence intensity (defined in terms of turbulent kinetic energy; TKE hereafter). The TKE within the sparse flexible canopies was higher than that in the sparse rigid canopies, while within the dense flexible canopies it was below that of the rigid canopies. Therefore, the sediment resuspension in the sparse flexible canopies was greater than that of the sparse rigid canopies. In contrast, the sediment resuspension in the dense flexible canopies was lower than that of the dense rigid canopies. Using different sediment types, the results of the study indicate that sediments with greater concentrations of small particles (muddy beds) have higher concentrations of resuspended sediment than sediment beds that are composed of larger particle sizes (sandy beds). This research was funded by the University of Girona, through the Grant MPCUdG2016-006 and by the Ministerio de Economía, Industria y Competitividad of the Spanish Government through the Grant CGL2017-86515-P.